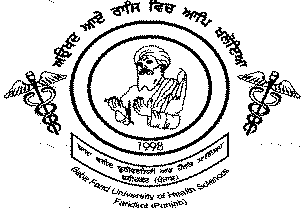 Punjab MBBS/BDS Admission 2018 is done by Baba Farid University of Health Sciences, Faridkot. The provisional list of candidates for Punjab MBBS and BDS admission has been released. Aspirants who have been selected for Punjab MBBS and BDS 2018 admission must report at the allotted seats for document verification and completion of admission procedure. Along with the list, Punjab MBBS seat allotment letter has been provided. The list of candidates and Punjab MBBS/BDS counselling allotment letter is available on this page below. The last date for completion of Punjab MBBS and BDS admission at the respective colleges is 12 July 2018. Thereafter, BFUHS, Faridkot will conduct the second round of Punjab MBBS/BDS admission 2018 procedure from the third week of July. Students who will not be allotted seats in Round 1 or who are not satisfied with the allotted seats can appear for Punjab MBBS 2018 counselling Round 2. Punjab MBBS/BDS admission 2018 is the basis for admission to around 1125 MBBS and 1000 BDS seats in the medical and dental colleges of the state. Read Punjab MBBS/BDS admission 2018 result, counselling rounds and more information from the table below. Latest Update: Punjab MBBS/BDS Allotment List has been released. Punjab MBBS and BDS allotment letter is available below. As per the latest notification by BFUHS, Faridkot, the admission to 85% state quota seats, MBBS/BDS courses under NEET 2018 will be done through common counselling. Punjab MBBS/BDS admission 2018 is also the basis for admission to colleges including under private universities and minority institutes will be done by BFUHS, Faridkot. From all government medical and dental colleges, 15% seats are reserved for All India Quota seats. The counselling for 15% AIQ seats will be done by Medical Counselling Committee (MCC). While the remaining 85% state quota seats will be filled by the respective state counselling authorities based on the state merit rank. Candidates can check the important dates of Punjab MBBS 2018 from the table below, in order to avoid missing any crucial event. The candidate should be a bonafide resident of Punjab to appear in NEET except for 15% All India Quota, NRI Seats and wards of Defence Personnel posted in Punjab. Candidates must have passed Class 12 Higher/Senior Secondary or its equivalent examination with Physics, Chemistry, Biology/Bio-technology and English. Candidates appearing in a qualifying examination in 2018 can also apply but they will be required to pass the qualifying examination by the date of counselling. Candidates must have passed in Physics, Chemistry, Biology /Bio-technology and English individually. STEP 2: Thereafter, fill the NEET, qualifying examination, personal and contact details in Punjab MBBS/BDS application form correctly. STEP 3: The bank challan will be generated after the registration. The application fee can be paid through net banking as well. Punjab MBBS/BDS application fee for general category is Rs. 5000, while for SC category it is Rs. 2500. STEP 4: Now, upload the scanned images of passport size photograph, signature, left-hand thumb impression and other documents as per the specifications. The size of images should be 25kb. STEP 5: Lock the application form, if the details provided in it is correct. No modifications can be done after locking. Thus, aspirants are advised to verify the entered details carefully. STEP 6: After verifying and locking the Punjab MBBS/BDS registration form, take a printout of application form. No hard copy is required to be send at the university address. 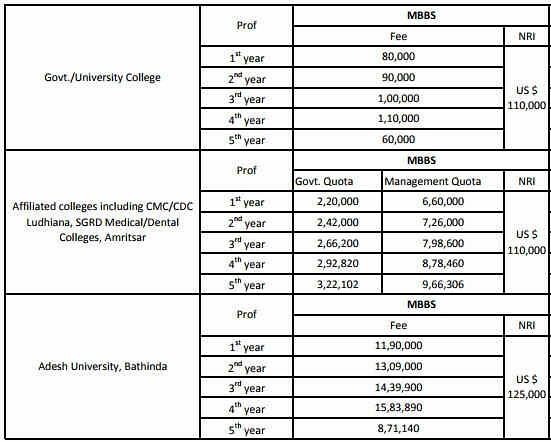 Fee Structure for MBBS course for admission to Government Medical Institutes as per the last year is given below. The semester wise fee which is to be paid by the candidates till the completion of the MBBS Degree is as follows. 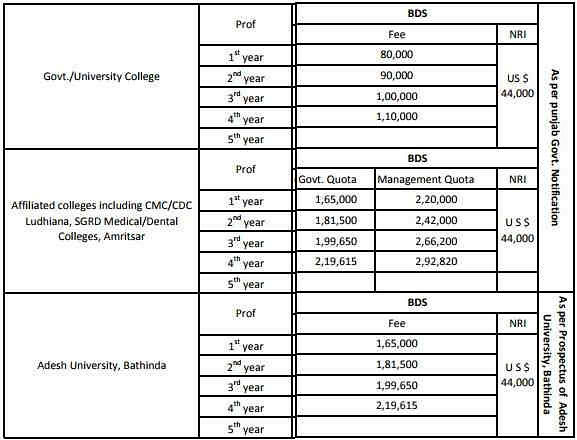 Check the fees structure of government colleges in Punjab. Punjab MBBS/BDS Counselling procedure has been started. Punjab MBBS and BDS counselling result 2018 for round 1 have been announced on 5 July. Along with that, the Punjab MBBS and BDS seat allotment letter have been provided on this page. The process to download the Punjab MBBS/BDS seat allotment result and allotment letter is mentioned below. How to download Punjab MBBS/BDS Seat Allotment Letter? Given below are the total number of seats available in Punjab for the admission to MBBS Course. The college wise distribution of the seats is provided below. There is a total of 1,125 MBBS Seats available in the state of Punjab in its 10 of the colleges offering MBBS Course. Below is the list of medical and dental colleges in Punjab. Punjab MBBS/ BDS Registration Form 2018 - Registration Started!